I recently got approached if i wanted to review a new Pregnancy App, i love my iPhone and most certainly love to try out new Apps when i was pregnant with Finn my favourite free app was “Pimp my Ultrasound”! “Pregnancy Planner” is the name of the App and after putting in my estimated due date i received from my Midwife i was ready to get started. It showed me loads of bubbles with information what the certain areas stand for which i thought was very informative. 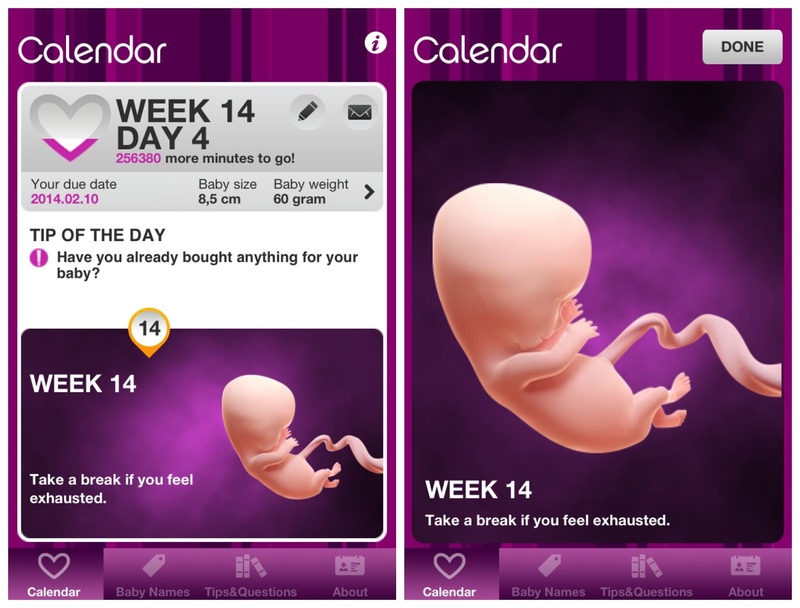 The Start screen shows you the Week & Day of your Pregnancy, your Due Date, the Baby’s size and weight and how many weeks/days/hours/minutes/seconds to go. It displays a Tip of the Day and shows you a embryo in your stage of the Pregnancy (this is Finns favourite because he loves to have a look at “Blob” every week bless him. If you push on the Picture you will get some information about your Baby and your Body which is very interesting to read. You can also choose the Taps: Baby Names (with your very own favourite list for boys & girls) as well as Tips and Questions which includes a fab checklist on all Baby related items you need to get as essentials and you are able to create your own Shopping List that you don’t forget anything and you can tick it off when you bought it. The only thing i am missing from this app to make it even better would be a section where i can add on my weight (this time around i like to see how much i put on every two weeks, or more like loose right now with my morning sickness) as well as a area where i could save some bump pictures every week. You can purchase “Pregnancy Planner” over at iTunes for only 1.49 Pounds HERE is the direct link to it! Disclaimer: I was gifted the Pregnancy Planner App for reviewing purposes however all thoughts and opinions are my own. We are leaving on a Jet plane….